Is there anything cuter than a wiener dog wearing a sweater?... These socks are! 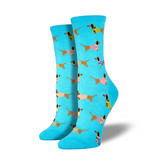 Our fashionable dachshund socks are sure to brighten up your sock drawer!